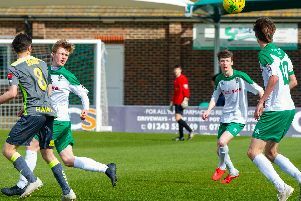 Bognor bounced back from two goals down for yet another draw on the road as Dan Smith and Harvey Whyte netted in the second half to earn a share of the points. The Rocks travelled to the Pakex Stadium to take on Potters Bar Town for the first time in the club’s history and were looking to improve after a disappointing display away to AFC Sudbury in the FA Cup as they succumbed to a 3-2 defeat. This, following being 2-1 ahead. Dan Smith was back in the side as they tackled an uneven, bobbly surface and early on a long ball down the left saw the home team's Andy Lomas try to find his man but instead it bounced out of play. Tommy Block fired in a shot after 90 seconds which forced the goalkeeper to push the ball over for a corner. Femi Ogunsola and Darnell Wynter had chances blocked before a penalty appeal by Bradley Sach went unnoticed by the referee. Potters Bar took the lead when a corner by Keegan Cole found Eoin Casey on the back post and he nodded it over Dan Lincoln and in. Jimmy Muitt did well to cut across the defence before shooting low but it deflected off team-mate Bradley Lethbridge. Keaton Wood failed to clear the ball and Wynter's cross found George Nicholas, who lashed it high and wide from just inside the box on 21 minutes. Smith was blocked following Harvey Whyte’s right-sided cross on 26 minutes. His low strike was denied by a brave block by Casey. Then Casey got in the way again with a fierce shot from long distance by Tuck and needed treatment after getting the ball full in the face. Wood went to ground holding his left ankle and required lengthy treatment but he - surprisingly - returned to play. But he couldn't carry on and Corey Heath replaced him on 37 minutes as he limped off. Chad Field thwarted Sachs and a counter attack saw Lethbridge run on and find Joe Tomlinson, who struck it left-footed but it went high and wide. Casey capitalised on a loose ball following a cross by Olufemi Olugunsola but Lincoln spilled it and Casey smashed it wide. The Rocks went further behind when a free-kick was awarded 20 yards out. Cole stepped up to drive the ball down into the bottom corner beyond the outstretched Lincoln. Calvin Davies was hacked down by Billy Adcock, who picked up a yellow card just before the half-time whistle blew. A long throw by Davies saw Smith latch on to it before controlling it and smashing it towards goal, but the goalkeeper denied him, diving to his right. Smith got a goal back for the Rocks on 49 minutes. He capitalised on a loose pass in the midfield and he used his pace before shooting low and just inside the post with only Laurencien to beat. Casey headed another corner over the bar, then Whyte hit the crossbar with a strike on the rise when the defence went to sleep on 52 minutes - and it was a much-improved opening minutes to the second half for Bognor. Lethbridge was replaced by Mason Walsh on 56 minutes. Heath's diagonal ball to Muitt saw him cut inside before shooting wide of the post, hitting the side netting and winning a corner. The following corner saw Block, Whyte and Tuck all denied from close range. A cross by Muitt saw Laurencien push the ball back out. Lincoln gathered the ball from a Cole free-kick before Whyte failed to find Smith with a pass. Ogunsola was denied from inside the box and then Wynter smashed one high and wide. Bognor were caught on the break but when Cole beat Lincoln with his low shot it was Block who had tracked back to divert the ball back off the line on 65 minutes. Then Cole was denied when he combined with Ogunsola, striking from the edge of the box but seeing the goalkeeper deny him. Davies was denied before a cross to Smith hit the side netting. Wynter threaded a shot through the defence but agonisingly wide of the goal with Lincoln diving. Bognor got their equaliser on 78 minutes when Whyte cut inside and unleashed an unstoppable curling strike inside the post to draw Rocks level. This followed great play from Tuck and Davies in the build-up. Smith hit one over before Muitt combined with Davies and called the goalkeeper in action yet again. Hassan Al-Murtada was shown yellow for his late challenge on Walsh, but Davies' free-kick was cleared. Bognor kept battling and deserved the draw from a game of two halves. They are fourth in the table with five draws and three wins from their eight league games - with the draws coming from their five away games. They look forward to welcoming Burgess Hill Town on Tuesday (7.45pm). Rocks: Lincoln, Davies, Tomlinson, Tuck, Field, Wood (Heath 37), Whyte, Block, Smith, Muitt, Lethbridge (Walsh 49). Subs not used: Scutt, Osborne, McCormick.